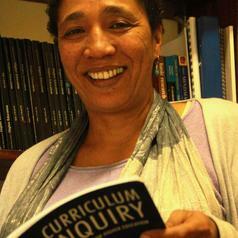 Jo-Anne has been working in the field of Academic Development since 1992. She has been involved in the curriculum development and teaching of the PG Dip (HE) since its inception and she currently acts as course coordinator for the Diploma. Since 2011 Jo-Anne and colleague, Lynn Quinn, have facilitated a version of the PG Dip (HE) aimed at academic developers. The first cohort from this programme graduated in 2013. Jo-Anne works in the areas of teaching and course evaluation, assessment as well as curriculum and teaching development. Her PhD study, completed in 2009, was a social-realist analysis of collaborative curriculum development processes in an academic department. She is interested in examining the interplay between structures (national, institutional, departmental and disciplinary), culture(s) and lecturer agency, and curriculum. Other areas of interest include the nexus between academics’ understanding of knowledge, disciplinary knowledge structures and academic identity; staff development and inducting the next generation of academics. Her Masters degree was in Psychology and focused on collaborative learning in higher education. She supervises postgraduate students at masters and PhD levels. Current students are exploring disciplinary knowledge structures and student learning, curricula and pedagogies for professional programmes and academic identities.